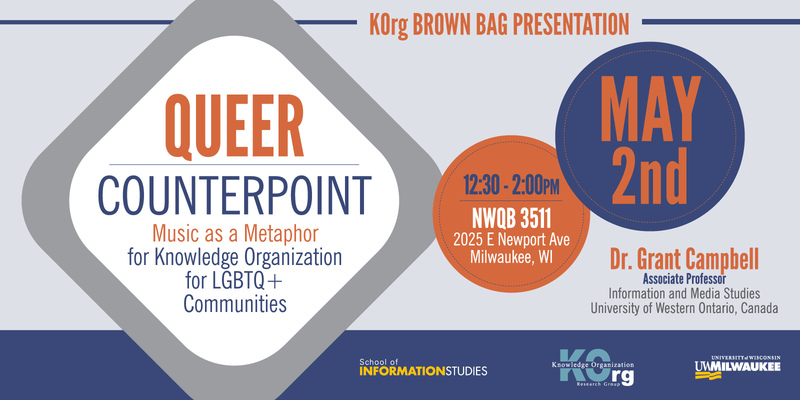 This presentation will explore musical composition as a metaphor for the persistent paradoxes in the organization of queer information. Classification for queer communities frequently evokes tensions between seemingly intractable tensions between universalizing and minoritizing perspectives. Rather than resolving these tensions, this presentation offers a means of sustaining multiple perspectives simultaneously, using the musical concept of counterpoint as a metaphor. Dr. Grant Campbell is Associate Professor in the Faculty of Information and Media Studies at the University of Western Ontario in Canada.He specializes in the field of knowledge organization, particularly as it supports the concerns of specialized groups, including individuals with dementia and their caregivers, and LGBTQ+ communities in both North and South America.His research on queer theory has been published in Library Trends and Knowledge Organization.